So, I ignored my own advice on how to start a blog and pretty much just up and started it! I bought a domain from NameCheap [affiliate], pointed it to my already existing hosting on SiteGround [affiliate], and then started to put the site together. In less than 48 hours, I had a brand new blog, and one… yes, ONE blog post up! That’s it guys, that’s how The Side Blogger (formerly known as Blog to Biz) started. A lot has changed since then. Not only the name, but the blog also looks significantly different from the days when it used to be Blog to Biz, and the most recent addition to the myriad of changes has been the logo! Pretty cool, huh… this transformation?! Now, here’s the thing. I’m a self-taught graphic designer, and still very much a student of this art. So, over the years, I have come to appreciate all the shortcuts to creating beautiful designs with the least amount of effort (and money) spent. Take the latest logo for example. I started the concept on Canva. Yeah, really! I started with a basic square design, typed the name of the blog with my fonts, played around with lines and shapes, and when I had something I kind-of liked, I opened up Adobe Illustrator to create the final product. And the said final product took another couple of hours worth of tweaking and playing around to get it to look like it does now. The whole thing, from concept to final version, took less than 5 hours. And well, even if I do not have the accolades, I think I’ve done a pretty decent job with it! And if you’re of a similar mind, I think you’ll enjoy today’s blog post — which is a step-by-step case study (basically a tutorial of sort) of how I designed this latest version of The Side Blogger logo! If you’re new to designing logos or using Adobe Illustrator, feel free to follow along with the steps I’ve outlined below to get a feel for how I designed my logo, and how certain functionalities on Canva and Adobe Illustrator work. I started blind. I knew I wanted something simple, but not exactly what I wanted. I also knew it was going to be type-based, since I can’t do anything too complex (my skills aren’t quite there yet). But really, other than that, I didn’t know what else to do. Lately, I’ve been using a lot of floral/food based images for my blog photos. Things are already a little over the top, if you know what I mean, so a simple logo felt like what this blog needed. And with that in mind, I got to work. The very first thing I did was open up Canva (FYI, if you don’t have one yet, you can open a Canva account for absolutely FREE!) and started a square template. Then I proceeded to type the name of the blog with my brand fonts. I’m using Lora and Lato, and after playing with both fonts, I decided I liked Lora better for my logo. I also have the word “the” on my logo. Initially, I wanted to have just “Side Blogger” for the name of this blog, but the domain wasn’t available. So I added a “the” in front of it. And now it’s become part of my brand, and I kinda like it too. It makes the name more personal for me. 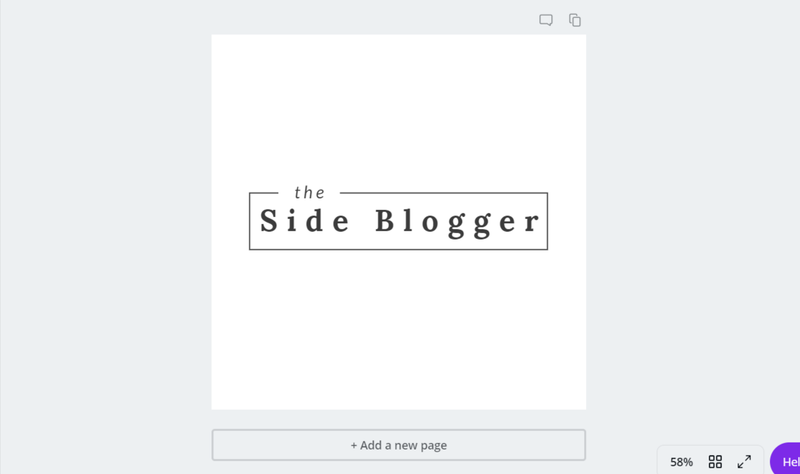 “The Side Blogger “(I like to think of it as a reference to myself — I’m the side-blogger), as opposed to a generic “Side Blogger”. None the less, “the” is a definite article and while it is part of the brand, I didn’t want a whole lot of focus on this word. So, I took the same style from the last version of the logo, and decided to add “the” in a smaller font size, on top of the logo, slightly indented. I also used Lato for “the” as it’s a more homogeneous font attracting far less attention than Lora. Both the fonts Lora and Lato are available on Canva for free. However, if you sign up for a Canva for Work account, you can add custom fonts. As for the layout of the logo, it’s purely something I came up with by playing around with it. It took me about an hour or so to decide on the initial concept. It’s simple, which is what I was aiming for, but with just a tiny bit of flair, like that white background for the word “the” which adds discontinuity to the surrounding black border. Here’s a detailed description of exactly what I did. 1. I started a plain square design on Canva, and then using the “Text” tool, I wrote the name of the blog and then positioned the two text-boxes (for “the” and “Side Blogger”) around until they looked like something I wanted. Using the “Spacing” tool, I spaced out the letters too. It’s a personal preference; I don’t like smushed up letters, specifically in logos! 2. After I had the basics down, I added a square border to give it an enclosed and compact look. But just that was boring, so I made it go behind the word “the”, and added a white background to “the”. To do that, I added a small white rectangular box behind the word “the”. You can do so easily with the “Position” tool. Just select the element, and use the “Position” tool to send the element to the back or to the front. It’s a similar concept to Photoshop’s Layers. Most designers start their concept on paper with a pencil. Sometimes I do that too, but I like how Canva allows me to see the digital concept before taking it over to Illustrator. Personally, I feel more confident that way. But it’s really up to the designer what kind of process they create for themselves for going from concept to creation. For me, it’s Canva –> Illustrator for logos. Canva graphics are not high quality enough for many things. For example, if you want to print your logo on promo materials such as business cards or envelopes or even just use on websites, you’ll likely end up with blurry images. Unless you make a huge file, and that’s not the best way to do things. Canva is also limiting in terms of what you can or cannot do. Now, granted, not everyone has the budget to hire a professional designer or the time to learn Illustrator themselves, but if you’re going to DIY your logo anyway, it may not hurt to know just the basics of some Illustrator functionalities. First of all, if you’re a newbie designer (as I am), you may be better off sticking to simple logos. Simple isn’t bad. In fact, some of the best logos out there are simple logos. The more flourishings you add the harder it gets to maintain harmony throughout your design. So yes, keep things simple. I like type based logos because they’re the easiest to create in Illustrator. Now, allow me to walk you through how I took the concept I created in Canva and perfected it in Illustrator. 1. I could have saved my Canva design as a png file and taken that on Illustrator, however, since the logo I made was so simple, and mostly just type-based, I decided to start over on Illustrator. Now, you may be wondering why I started on Canva if I was going to start over on Illustrator. Well, Canva was my own version of paper-and-pencil. It’s easier to play around with simple types and shapes on Canva, so that’s what I did. After I knew the general direction the logo was going, it was much easier for me to recreate it in Illustrator. I started with a new 2400 x 2400 px artboard on Illustrator. Then I used the “Type” tool to write the name of the blog just like I did on Canva. I had also downloaded and installed the fonts Lora and Lato on my computer beforehand. 2. After the text started looking like what I wanted it to, I added the border using the shape tool. I chose a rectangle shape tool to draw the shape. I made sure to have a transparent filler so that I can see the text, and chose a stroke width (border width) of 4 pt. 3. Then, I drew another small rectangle for the white background for the word “the”, just like I did on Canva. You see, a lot of the concepts and their executions are exactly the same on both programs in the initial stages. After drawing the smaller rectangle, I sent it behind the word “the” but in front of the larger rectangle so that the border is hidden behind the smaller rectangle. To do that, I expanded the layers panel on the right, and left-clicked on the rectangle layer, then moved it behind the later consisting the word “the”, and I also dragged the larger rectangle layer behind both small rectangle layer and “the” layer. 4. Now it’s time to expand the layers so that we can create vector files. These are the files most printers want for maximum quality. Type-based layers are super easy to vectorize. No need for additional cleanups. If you want to vectorize a hand-drawn logo, there are usually a whole lot of steps involved. But this logo is super simple. I selected everything by clicking Ctrl+A (Cmd+A if you’re following along on a Mac). Then I clicked on “Type” from the top menu, and then clicked on “Create Outlines”. This converts individual letters into shapes. Pretty neat, right? 5. And now, I figured I’d do something else to give this boring logo a bit of jazzy feel. Now that all my letters can be moved separately (since these letters are all individual shapes now), I decided to bring down the “i” of the word “Side” and the first “g” of the word “Blogger” down just a bit. To select an individual letter, I clicked on the direct selection tool. Then by selecting the letters, I brought them down by using the down-arrow on my keyboard. I also decided to add another rectangle on my design to hide part of the border right below the double-g’s. These are all stylistic choices I made based on my personal aesthetics. There’s no way for me to teach you how to come up with these ideas, other than that you need to practice to get a sense for such things. 6. Now, remember how I created outlines for the text? I want to do the same for the rectangular shapes as well. This will come in handy for the next step. To do that I once again select everything by clicking Ctrl+A (or Cmd+A on a Mac). Now I go to “Object” on the top menu and click on “Expand” from the drop-down. Now here’s the thing. I could have done this from the beginning and everything would have been converted to shapes and outlines. I didn’t need to create an outline for my text alone like I did in step 4. But this feature (creating outlines for types alone) sometimes comes in handy when you’re dealing with mostly type based texts, or if you do not want to convert some shapes into outlines but you want to convert your letters into separate shapes. So I left that step in here just in case. This is good to know if you’re learning Illustrator for the first time. 7. After expanding all three rectangular shapes, I want to merge them together, so as to make a more seamless design. To do this I select the three rectangular shapes. To do this, I clicked on “Shift” on the keyboard and then used the mouse+left-click to select only the three rectangular shapes. After that, on the right panel, from under “Pathfinder”, I clicked on the “Merge” shape (as shown in the image below) to merge everything. If you’re following along and you do not have the Pathfinder panel opened, go to “Windows” from the top menu, and then select “Pathfinder” from the dropdown. This will open up the Pathfinder panel. 8. Now I’m ready to save my logo. In fact, initially, that’s all I did for the logo. And I’m happy with it. I only added the flourishings later on. The “main” logo is just what you see here. The flowers are temporary things that I may decide to get rid of later on. I prefer to save logos in four (4) kinds of file types. The first type is a regular .ai file which is the default file type for all Adobe Illustrator files. The second is the .eps format. It’s an open source file format. Basically, if in the future, you or a designer you’re working with does not have access to Adobe Illustrator or prefer to work with a different program that can handle vector files, you (or they) will be able to open .eps files on any program able to render vector files. The third is the .svg format, which basically converts the shapes into an HTML/CSS type file. This is the best file type for when you’re using your logo on websites. The final one is the transparent back .png file. They can come in handy for when you do not need high-quality files but just want to add something low resolution. You can also use this format when you’re making designs on Canva. Canva doesn’t take .svg files or vector files (.ai or .eps), so the png file is the only way you can add your logo to your designs on Canva. To save, go to “File” from the top menu, then select “Save as”. This is an additional step in designing my logo. As much as I like the logo above, I still felt that I wanted to add something more. And since I’ve been digging flowery imager on this blog as of late, I decided to go with that. Now, I have a good design, but my artistic skills are limited. The flowers you see on the logo? Those aren’t drawn by me. I got them from Creative Market [affiliate]. Here’s the thing about Creative Market. I absolutely LOVE this marketplace. You get some of the best and coolest things from this place. They have a TON of vector graphics designed by some of the coolest designers out there. And they’re VERY affordable! Here’s the specific product I used for my flourishings. This product has a lot of separate vector items. To use them, I opened up the vector file on illustrator, and used the direct selector tool to select the specific designs I was going to use, then I copied it (Ctrl+C on a PC and Cmd+C on a Mac), then pasted it on my own design (Ctrl+V on a PC and Cmd+V on a Mac). I used the direct selection tool again to resize and move to where I wanted the flowers to be and then saved the file when it looked like how I wanted it to. As you can see above, these files are already vectorized, so all you need to do is choose the shapes you want to use with the direct selection tool. Simple, right? And so pretty! And there you have it. That’s how I designed the latest logo for this blog. Feel free to replicate if you’re trying to learn to design logos and use Illustrator. Illustrator can be intimidating, but just by using some of the basic and simple functions, you can create professional level logos and graphics. I love the growth of your blog logo! Designing is not my strong suit but this post helps give me a better direction. Thanks for the tips! Hi Teya, thanks! Good design is really just about practice! Good luck! I’m still learning to navigate through all the programs on my computer, a raw beginner. I always find your posts to the point and including that little bits of detail that I sorely need. Immensely valuable, thank you Maliha! Hi! Do you own your logo?